Campaign background: UVM's Student Labor Action Project launched a "Livable Wages" campaign last fall, focusing mainly on foodservice workers on their campus that are contracted by Sodexho, but demanding a living wage for all workers on their campus. 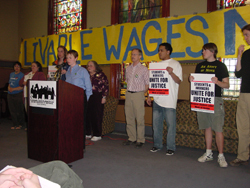 A living wage policy has already been adopted by the city of Burlington and SLAP is working closely with the Vermont Vermont Livable Wage Campaign and the Vermont Workers Center. Students have already presented their list of demands to UVM President Fogel, and are publicly awaiting an answer by April 7 as to whether the university will adopt a living wage policy and ensure the freedom to organize on UVM's campus. SLAP plans to continue doing educational and escalating events during the National Student Labor Week of Action. Check back for exciting updates as the UVM campaign heats up this spring!